1 of 4 Heat oven to 425 degrees . In a small bowl, stir together the lettuce, mayonnaise and lime juice; set aside. 2 of 4 Bake fish at 425 degrees according to package directions. Wrap tortillas in aluminum foil and place in oven for final 10 minutes of cook time. Remove fish from oven and cut each fillet into 6 chunks. 3 of 4 Microwave corn for 1 minute. 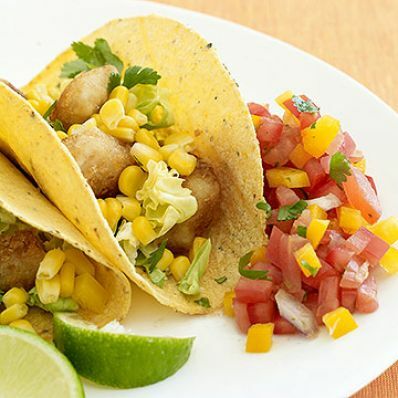 Place 3 to 4 pieces of fish in each tortilla and top with about 2 tablespoons lettuce mixture and 1 tablespoon of corn. 4 of 4 Serve tacos with salsa, if desired. Per Serving: 47 g carb., 17 g Fat, total, 25 mg chol., 3 g sat. fat, 6 g fiber, 526 mg sodium, 381 kcal cal., 12 g pro.